A few weeks ago I had a really good clear out of the studio. A combination of lots of markets and events, and very little time in between had left it in quite a state - to the point that I was spreading out elsewhere to work. Four epic hours later (having gone through the distinct phases of - let's do this! - oh god there's so much in here... - I want to cry - what have I done? - oh look, floor! - and yay! lovely room! ), I had a nice organised space to work in again. The biggest job I tackled was one I'd been putting off. I have one of the large Ikea Expedit shelving units and, if I'm honest, it'd been a couple of years since I'd sorted it out properly - this took the bulk of the 4 hours. It's now looking great and is a proper stock storage unit (as it was meant to be). 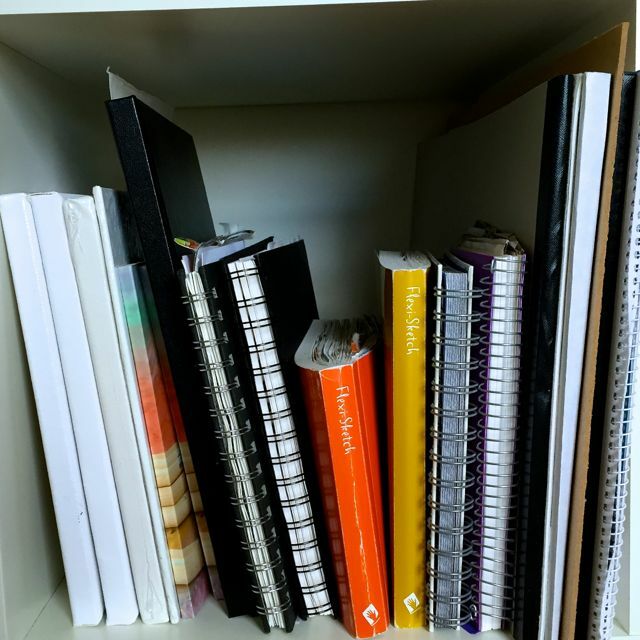 It also houses, my ceramic bits, art materials and sketchbooks and my increasingly huge collection of art and craft books (just a few of them below). I'm deliberately keeping the top clear (ish) so I can set up little impromptu photo shoots for small items, little things I want to photograph for Instagram etc. In the process I found lots of things I'd forgotten I had, like this plate I made in my ceramic class about 10 years ago. I'm now off to write myself a sign to go up in the room to read "tidy up as you go along!! ".